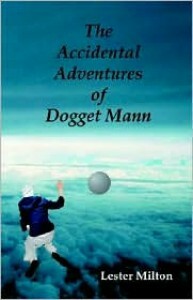 Let me begin with a deep and heartfelt apology: Dogget Mann has been sitting on my shelf, unread, for a long, long time. For that reason alone I am ashamed for not having told the world about it sooner. I don’t think the slightly increased knowledge of this story would have improved the world noticeably in the past few years, but perhaps exponentially as the years passed for certain. I feel a genuine sense of guilt for not adding my voice to the support of this book, author Lester Milton, and to the bright but hapless Dogget Mann himself, who seems to find himself everywhere but the right place in the right time. Dogget’s matter-of-fact view of the world lends to some amazing insights about human behavior—it’s easy to warm to him quickly, particularly contrasted to the chilly nature of the world in which Dogget lives. Dogget loses his parents early in life, and escapes still others along the way, all the while searching not for adventure, but for an existence the content take for granted. Naturally (otherwise this would be a considerably shorter story), he is unable to find either. Lester Milton’s storytelling is wry and breezy, and may come off as deliberately simple to appeal to younger readers, but, in the end, his story might be too smart for them. Here and there the story is dotted with poignant life lessons, drawn all the sharper by Dogget’s clarity of thought, offhandedly breaking down behavioral problems, and solutions, in the space of a paragraph addressed to the family members he is escaping. His conclusions about the behavior of those around him are simple, straightforward, plain, and yet these easy solutions to glaring character flaws had, to the instant of Dogget’s analysis, escaped them. Viewing the world through the unclouded lens of a child’s eyes is always fascinating, and opens our own to the ease with which we ought to be able to rectify our interpersonal ills, which makes our inability to correct them even more profound and perplexing as individuals and observers. The biggest tragedy, or at least a close second compared to the adventuresome events in the life of a boy who is simply looking for stability, is that this book has been overlooked for so long. Again, because of my neglect, I feel partially to blame for this. Dogget’s story is an amazing and striking one that deserves your attention, but, like the boy himself, has nevertheless remained lost despite all his efforts. I'm sorry, Lester, that I haven't written this sooner--I'm also sorry that the rating system ran out of stars.